Autism superheroes and "talking" Bluetooth-enabled stuffed animals are among the resources for helping children on the autism spectrum understand their differences and communicate with others. Autism spectrum disorder (ASD) leads to developmental challenges that affect social, behavioral, and communication skills. The latest statistics say that about one in 45 children are affected by some form of ASD. Thankfully, technology has offered us groundbreaking tools for improving the lives of those with autism through augmentative and alternative communication (AAC) apps -- software that helps people with autism and communication difficulties express themselves (one of their main challenges). There are cool tools and creative educational games that can extend the development of communication, behavior skills, and social-emotional wellness, and help deliver learning in a non-threatening manner. Research shows that two out of three people feel uncomfortable when talking to a person with disabilities. While this awkwardness stems from ignorance and fear, other studies indicate that being around people who are different from us can make us more tolerant, more creative, work harder, and possibly even become smarter. April is National Autism Awareness Month and the perfect time to share some invaluable resources that may not be so well known in the mainstream. It's also the perfect time to work with your own students or children and use some of these tools and concepts to help promote understanding, mindfulness, and acceptance of ASD. Jodi Murphy is a dedicated mom and founder of Geek Club Books with a mission to help educate parents, teachers, and children about what autism is. She has developed an incredible website chock full of insightful, interactive, and inspiring tools that approach this topic in a compassionate way. Her main undertaking is to change people's preconceived perceptions and end the stigma that surrounds autism. These products tell the stories of autism through apps, digital media, curriculum, and webisodes. The creative nonprofit is focused on innovative autism awareness education. A team of adults with autism is involved in everything Geek Club Books produces. Additionally, there are essential questions, vocabulary lists, writing prompts, personal space suggestions, role-playing components, and so much more. Make sure to read the background information, which is based on a true story of one young man's life growing up on the autism spectrum. We want to make the topics of autism approachable through children's stories and pop culture-style webisodes. The companion curriculum and activity guides make it easy for educators to integrate into their lesson plans. Laura Jiencke of Kayle Concepts and her Bluetooth-enabled Bluebee Pals discovered that her product was making inroads not only with the general population, but also with many children experiencing communication difficulties. 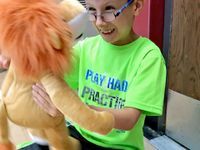 These adorable plush animals interact with kids in a nonthreatening way and urge them to take a risk. The product supports both expressive and receptive language skills and has been amazingly successful for children on the autism spectrum and other children with special needs. The mouths of these stuffed animals move in sync with both Apple and Android devices. They are able to connect with any app -- music, stories, and sound-driven educational games. These huggable "smart" companions can sing, read, and answer phone calls. Recently, this socially-conscious company added a line of Bluebee Pals Pro. Their short video about how to operate the Bluebee Pals gives a succinct overview of all the new features and how to work with these tech companions. A year ago Jodi and Laura were introduced, and a collaboration between the two resulted in the production of Bluebee TeeVee: The Autism Information Station. The webisode series teaches kids all about autism in a friendly, accurate, and respectful manner, with comedy and some pop culture references thrown in for entertainment. It's an original program that helps children see past differences, learn acceptance and understanding, and discover that we're all pretty much the same at heart. Host James Sullivan is also the scriptwriter, filmmaker, and editor. Jonathan Murphy performs the character voices for the Bluebee Pal co-hosts. Both of these talented young men are on the autism spectrum. Companion episode guides contain suggested resources for parents and educators along with classroom activities.